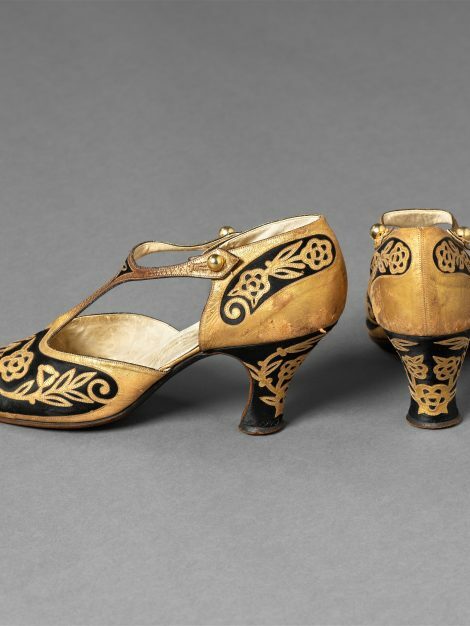 Acquired from the collection of the costume designer Shirley Russell. Stamped: Perugia, 11 Faubg St Honoré, Paris. 21 Ave N. Dame Nice, Model no: 12407 28294. 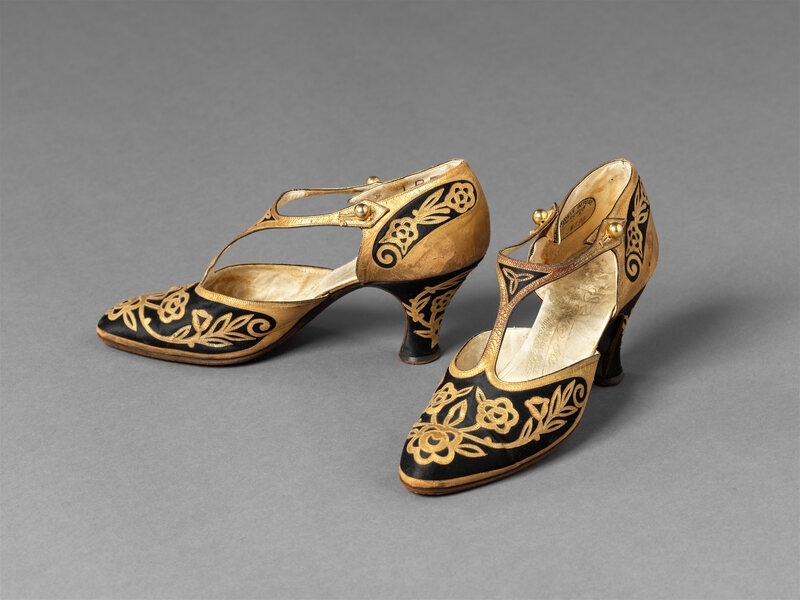 The quality of these shoes, by André Perugia, 1893-1977, is immediately evident from the intricate gold leather appliqué work on the black satin ground. Similar models in different colours and materials, and without the T strap were also available from this prestigious shoemaker. 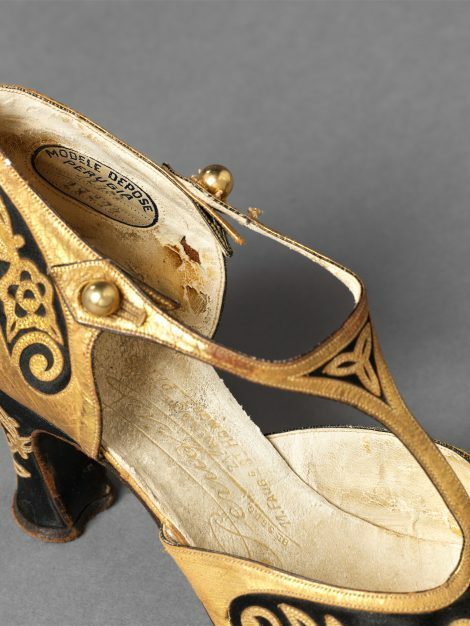 The son of an Italian cobbler, Perugia first made a name for this footwear in Nice, a winter resort patronised by the rich and famous, before the First World War. 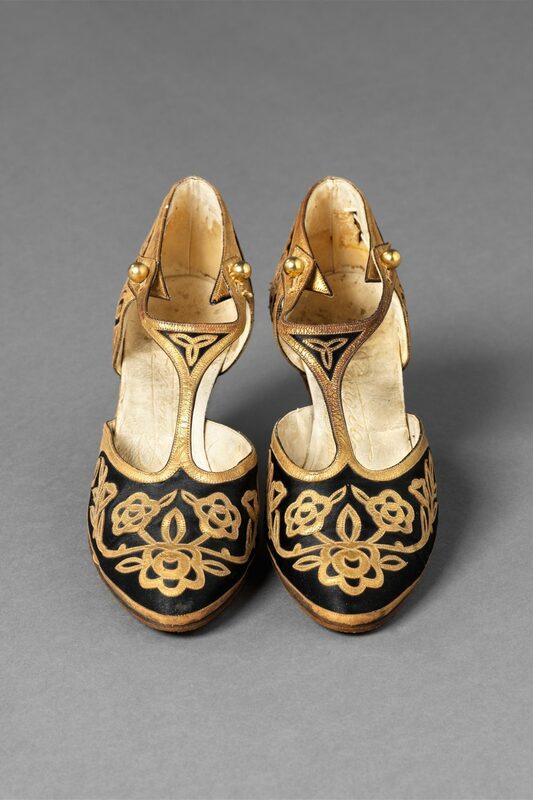 There he came to the attention of the designer Paul Poiret, with whom he collaborated, later establishing collaborations with other couturiers like Schiaparelli and Molyneux. 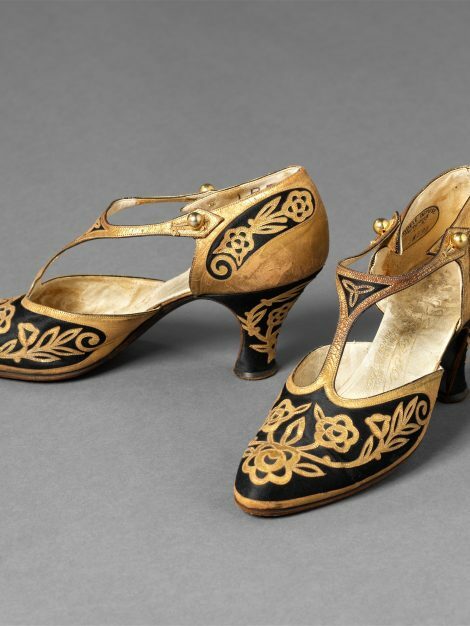 He was astute enough to take advantage of the burgeoning film industry, designing shoes for Hollywood actresses. His Paris shop opened in 1921. During the First World War, Perugia gained experience of engineering techniques in an aircraft factory. 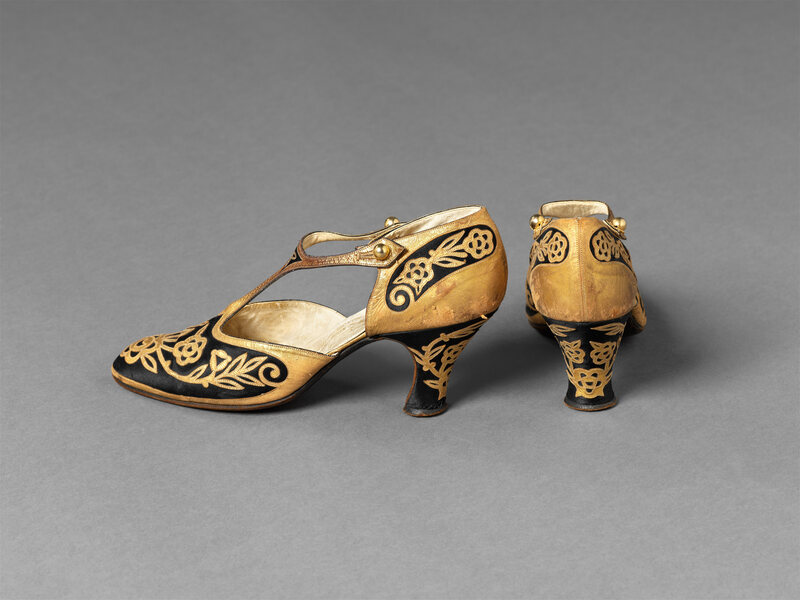 This led to an understanding of the ergonomics of shoe design, an insistence upon innovation in manufacture, and an experimentation with unusual materials for which he became well-known. 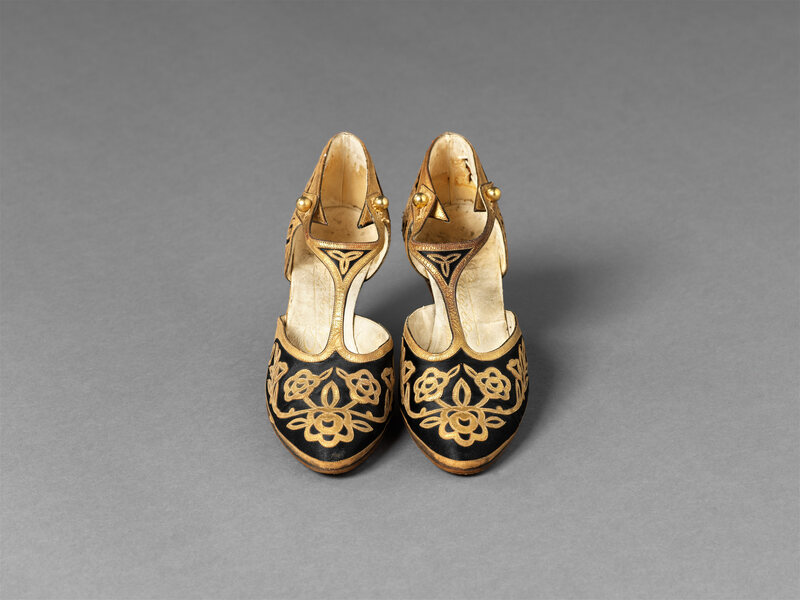 The intricate design of these shoes attracted attention in the press. 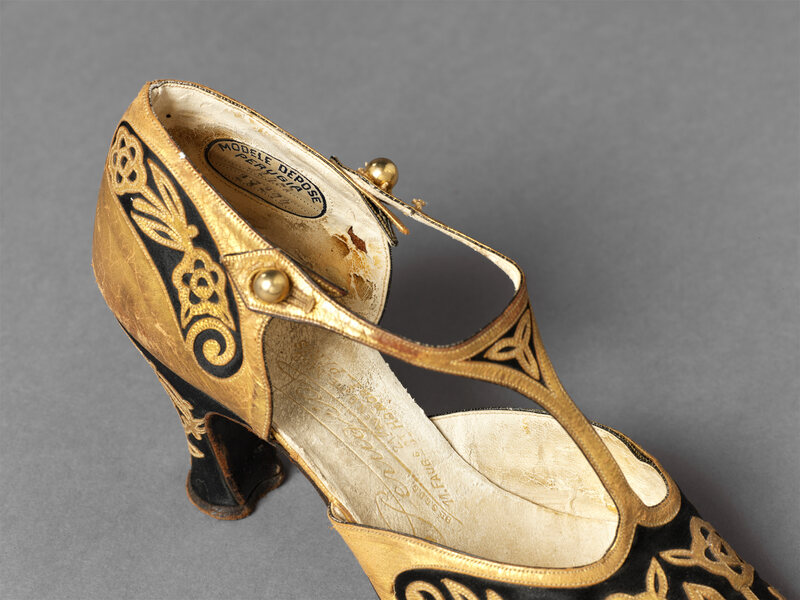 In 1923 it was illustrated by Pierre Mourgne in the ‘Gazette du Bon Ton’, an expensive and luxurious fashion magazine; a scantily-clad dancer from the Moulin Rouge wore a pair on the cover of the June 1928 issue of ‘Paris Music Hall’. In 1956 the design was put into production once again by the American company I. Miller, and drawn by Andy Warhol for their advertising.